Inspired by a recent trip to Italy. Over there, food is a religion. You are allowed to mess up lots of things in Italy, food is not one of them. A few years ago I saw a movie set in Italy called I AM Love. A subplot in the story is about a young passionate chef who wants to build a restaurant on top of hill outside the city. His customers would have to drive out and then climb a mountain to get to the place. To me this seemed super unrealistic. “This would never work” I thought to myself while watching the movie. “This would never work” in Canada … that is. Now that I have been to Italy I see this in a totally different life. The thing about Italy is not that the food is amazing (it is), but how passionate people are about food. An Italian will speak about food even while eating. One friend I met with while I was there described a type of fig flavored mustard as if it was a fine jewel. Another friend, when asked about a name of cheese, would proceed to answer the question by telling me about the special characteristic of the town the cheese came from and how it effects the taste of the cheese. Each food came with an origin story and was surrounded with a context. Dining with Italians is an adventure I would highly recommend. It’s not that the food is amazing (it is), but that the enjoyment of it is multiplied through the communal experience. In memory of many majestic meals in Italy, I decided to make the Epic Rainbow Pasta Sauce. To make béchamel sauce, I melted the butter, added the flour and then gradually added milk while mixing continuously. I added salt and pepper. Orange: I peeled and chopped the carrots until soft. Then I pureed them with olive oil, salt and pepper. Yellow: I drained the corn, then pureed it in the food processer. I sautéed chopped onion in the olive oil. Added the corn into the mix and then added salt and pepper. Finally I boiled the lasagne noodles just barely to cook them leaving them still hard but edible. I marked the serving plate with some of the dry ingredients so that I could guide my hand when pouring the sauces. I used a cookie cutter to cut out flower shapes in the lasagne noodles. While pouring the sauce on the serving plate, a few times, one sauce would drip over the other. I corrected this by placing a correcting drip on top to hide the mess-up. I placed the pasta flowers on top and sprinkled with some grated parmesan. I have to say that I was surprised by how good the carrot sauce was. 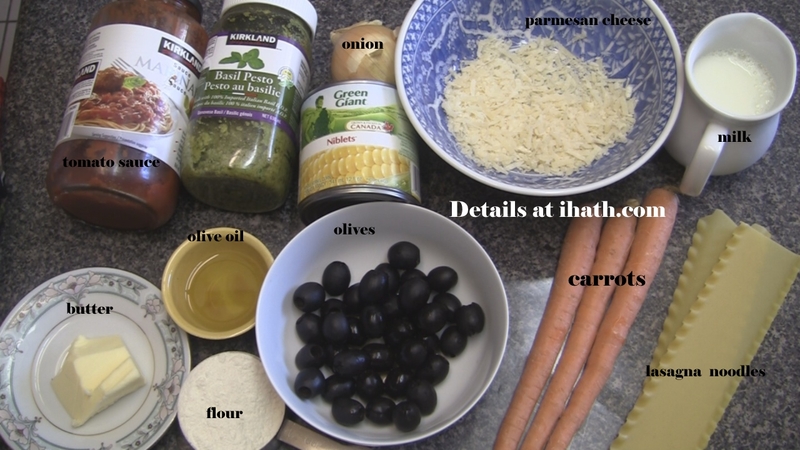 I will have to develop a carrot pesto sauce. The sweetness of the carrot mixed with olive oil was some sort of magic I didn’t expect. I was also surprised with how good the corn tasted. Preparing it was simple. I wouldn’t expect corn to taste good with pasta, but it does. It really really does. For yellow, I was planning to make pureed roasted yellow peppers. I didn’t have any in the fridge. I felt too lazy to go shopping for a single ingredient. I found a can of corn in my cupboard and thought: “Whatever! this will have to do.” An accident turned into a discovery. The only thing that didn’t work out was the blue béchamel sauce. It tasted the way béchamel sauce should. However the color stood out as strange. My family kept asking: “Mom! what is this?” “Mom! why is it blue?” … etc. Because all the other sauces had a natural color which matched what it tasted like, the blue stood out. In hindsight I wish I left it white or found a different alternatives. I served the whole thing with a side of plain boiled macaroni noodles. It was fun to scoop a cross section of the different sauces on the each individual serving plate, eating them individually, or mixing them in creative combinations. Olive and corn. Carrot and béchamel. Tomato, pesto and black olives and …… the combinations are endless. A fiesta for the taste buds.